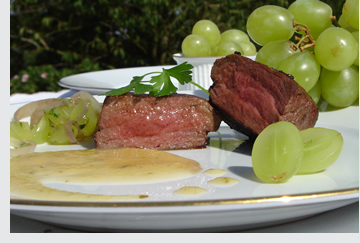 Venison is now recognised as being one of the most nutritious of all red meats and is remarkably low in fat. Venison is not marbled in the same way as beef and lamb. With less than 2% fat (that's less than skinless chicken), no salt and no sugar, venison shows green all the way on the ‘Traffic Lights' scheme. And because it is so low in fat, venison is a good source of healthy protein. Venison is also an excellent source of iron; indeed it delivers more available iron than any other domestic meat, and much more than vegetables; an important fact because most British women are short of iron. It is also high in Vitamins B6 and B12, potassium, phosphorus, riboflavin and niacin. It is a source of zinc. As important as being lower in fat and saturated fat than other red meats, venison is higher in polyunsaturated fats, with highly favourable saturated to polyunsaturated (P:S) ratio and omega n-3 to omega n-6 ratios. This is largely because deer feed on grass and vegetation rather than high-energy cereals. It may also be because they have not been artificially bred for centuries to produce fat; indeed venison is the meat our ancestors ate for millennia, it is really the meat that humans are designed to eat; the one we have evolved to eat. Nutrition chart above: McCance & Widdowson’s ‘The Composition of Food: Meat, Poultry and Game’, 1995. Their samples were from young deer. PUFA and P:S ratios: Rosemaund/ADAS research in partnership with FSA (in print) 2009.